Russian writing, rightly or wrongly, is synonymous with huge, bookshelf-threatening novels, but for those wishing to tackle the epic works of Dostoyevsky and Tolstoy, it’s a good idea to start elsewhere – and this is elsewhere. 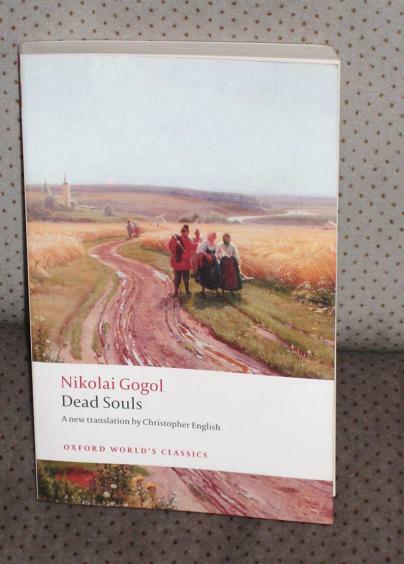 Nikolai Gogol’s Dead Souls is where the Russian (literary) revolution started, the first important novel in the Russian language. The story follows Chichikov, a fallen civil servant turned confidence trickster, as he roams the expansive Russian countryside, pursuing the ultimate get-rich-quick scheme – the purchase of deceased serfs who are still on the tax rolls of the landed gentry. By accumulating a paper army of peasants, our hero hopes to be able to borrow money against their names, which will allow him to buy an estate of his own to settle on (and where, hopefully, his dead souls will be permitted to rest in peace…). Dead Souls is inimitably Russian, perfectly dissecting the foibles, faults and fortes of the national character. Gogol beautifully depicts the natural generous hospitality flowing from Russian households, the mounds of food and rivers of vodka liberally dispensed whenever a friend – or stranger – appears at one’s doorstep, and the complicated, symbiotic relationship between master and servant in pre-revolutionary Russia, one in which the master does not always get the upper hand. As Russian as it is, however, any reader with more than a passing interest in classic literature will notice influences from, or similarities to, other famous writers. Chichikov’s rambling visits bear comparison with Pickwick’s fact-finding missions through the English countryside, and the different landowners he meets lead one to remember the wildly differing lands Gulliver passes through in Jonathan Swift’s classic tale. Even the benevolent, omniscient and, at times, jovial narrator is reminiscent of Trollope and Thackeray at their best. In terms of the attention to detail, it is to Dickens again that the mind turns when reading the many lengthy digressions Gogol intersperses throughout Dead Souls. Pages are given over to descriptions of the vast, seemingly never-ending, Russian countryside, mental images of golden fields, rustic villages and majestic forests leaping from the page. Yet just as much effort can be devoted to tangential discussions, with the writer quite capable of leaving his hero to get on as well as he may by himself, while the author expounds upon matters philosophical or literary. Sparse prose is not Gogol’s forte, and that is a very good thing indeed. Christopher English, the translator of my Oxford World’s Classics version, has done an excellent job of transferring Gogols’ florid prose into English, ensuring that the force of the language is not lost on those unable to read the book in its original form. Of course, as many of you may already know, there is an elephant in the room (blog), and sadly it can be ignored no longer. Dead Souls was intended to be a three-part epic, charting Chichikov’s rise, fall and moral redemption, but the writer was plagued with moral and religious doubt and, shortly before his death, burned the manuscript of the second part. As a result, all we are left with is the fully-published first part, and the remains of the second, cobbled together from some old exercise books found amongst the author’s belongings. As good as the work is, it’s frustrating to know that it could, no would, have been much better. I think I've only ever read some Tolstoy, Dostoevsky and Chekhov (but not much.) Must go and look for some Gogol now! On a different note, have you read any contemporary Russian novels? Am curious now. And I don't really agree that Dead Souls would have been better with more of it. On the contrary, we're better off without the later parts – Gogol, the man, had suffered some sort of breakdown. He was not the same writer. And Part I is complete. Anyway, I don't see the eveidence, from the parts we have, that Gogol was writing at anything like the same level. But since I think this is the Greatest Novel of the First Half of the Nineteenth Century, why would I think it could be better? The way you pull in the tone, the pieces, of other writers, is helpful. Lots of echoes in this novel, aren't there? “The Nose” and “The Overcoat” are the best of the stories, and don't miss “The Government Inspector,” which previews certain features of Dead Souls, and is hilarious. Sakura – Substitute Turgenev for Chekhov, and my Russian reading is much the same as yours! Sadly, I haven't read anything recent by Russian authors; the closest I've got is Andrey Kurkov's 'The President's Last Love'(Ukrainian, but written in Russian). His most famous book is 'Death and the Penguin'. Amateur Reader – Funnily enough, I was thinking firmly of your post when I wrote that 😉 Keen to get onto those short stories very soon. I really enjoyed the connection to The Inferno, being a retelling and all. As I loved The Inferno, I really liked seeing how the two aligned. It also helped that I didn't know any of the plot of Dead Souls in advance. I haven't read 'The Inferno', so I'll have to get onto that 😉 Also, I have joined the directory (although my description does not really take the whole thing as seriously as everyone else seems to have done…). ← Review Post 41 – Hey, teacher – leave those kids a… No, actually, give them a kicking, they deserve it.